324 pages | 50 B/W Illus. 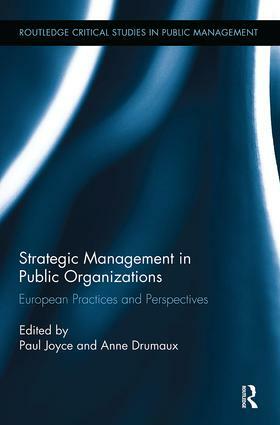 Strategic Management in Public Organizations: European Practices and Perspectives offers the first wide-ranging survey and assessment of strategic management practices at various levels of government and public service in European countries. It shows that strategic management is much more than a management tool imported from the private sector - it has become a key element of public management reforms, and European governments at all levels are developing ‘strategic state’ characteristics. Written by leading European experts on strategic management in the public sector and in government, this book presents evaluations and analysis based on empirical investigations. The book covers strategic management at different levels of government, explore the roles of different players, and incorporate theory and practice, with opening and concluding chapters by the editors that provide an overview of strategic management in the public services and a cross-societal discussion of practices, reforms, and lessons. It reflects not only developments in strategic management practices in the European public sector, but also the increasing importance of strategic capabilities for the modernization of public governance. This book is ideal for students in postgraduate management courses (MPA, MSc, or MBA) in Europe and elsewhere. Paul Joyce is Visiting Professor of Public Services, Leadership and Strategy at Birmingham City University, UK. He was formerly Director of the Business School at Liverpool John Moores University. His recent work on leadership and strategic management in the public sector includes Strategic Leadership in the Public Services (2011; Routledge) and Lessons in Leadership: Meeting the Challenges of Public Services Management (2005; co-authored with Eileen Milner; Routledge). Anne Drumaux is Professor and Academic Director of Executive Teaching and Public Management at the Solvay Brussels School of Economics and Management at the University of Brussels, Belgium. Her key research interest lies in the interaction between public policy and strategic management.